Bowthorpe Road heads off of Dereham Road not far from the waterworks, and after passing cemeteries and hospitals in not unpleasing proximity it heads off across the outer ring road. For the first time, you feel as if you are entering suburbia. The busy road lines another cemetery to the south, and this pleasant group of buildings is set slightly back from the road looking out across the headstones. There are effectively two churches here - or, at least, I assume that what is now the hall was originally the church, and that the newer church was built further back, behind the first, leaving room for a drive and a small car park. 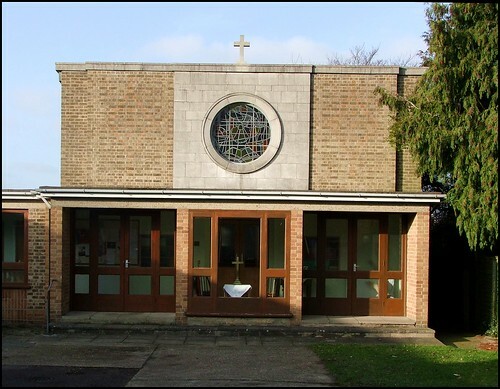 The older church is red brick, and its assymetrical roof suggests the work of the 1950s. It is simple, adorned with a cross and two flanking shuttered windows facing the road, but rather more functional behind. The new church behind it is a rather more impressive prospect, built in yellow brick with a pleasing coloured glass window which combines a variety of symbols. There seems to be plenty going on here, and the church appears to share its premises with a small Steiner school as well.